EMCVu is a new software option that is an all-in-one pre-compliance and debug solution for all real-time spectrum analyzers. Engineers now have a fast, easy, accurate and affordable way to determine if your new product designs are ready to submit to the test house. To get EMCVu, your first step is to make sure you have the latest version of SignalVu-PC software - V3.13. If you already have the latest version of SignalVu-PC, please continue on. If you would like to learn more about SignalVu-PC, can visit the product page here. To immeditely download the latest version of SignalVu-PC, please see the first software downoad link below. Once you have the latest version of SignalVu-PC, you'll need to get a licensing key to unlock EMCVu. You can either download a free trial licensing, OR you can purchase the software licensing through the "request a quote" links in the below table. Step 1: Ensure you have the latest version of SignalVu-PC here. Tektronix offers a complete set of validated accessories including antennas, Line Impedance Stabilization Networks and pre-amplifiers available in bundles or separately for both conducted and radiated tests. All of Tek’ accessories are pre-loaded into EMCVu. 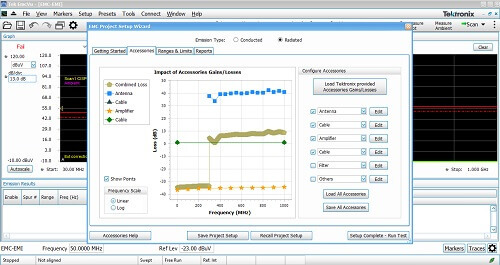 This means loss and gain of accessories are already captured in the software and are taken into account during the measurement. We’ve done this to help speed up setup and help you get more accurate results.